In all of our lives there will come times when we face situations we can not “fix”. Times when the situations are beyond our own abilities to solve. It is essential for us during these times to do what we truly are able to do – turn to our God who cares even more than we do and who is able to do what we are not able to do . . . solve or “fix” the situation in the best way possible. Yes, we need to be people who pray. This may sound “cliche”, but it is the truth. We need to be people who pray – in the difficult times as well as in our every day lives. This is true for us, but it is also true for our grandchildren. Teaching them to be people who pray is one of the best and most important things we will ever do as grandparents. We can be certain our grandchildren will also face situations they are not able to “fix” or solve throughout their lives, but if they know how to talk with God, they will be able to find comfort and strength for whatever it is they are facing. My husband and I are praying through the Book of Psalms this year. We are using my book; Deeper In 4 Grandparents & Parents, Too – Praying the Scriptures for the Children You Love – Psalms Edition. This book guides us as we pray through a different Psalms passage each week for our grown children and our grandchildren. When our grandchildren heard we were doing this, they wanted to pray through the Psalms with us – yes, my grandma heart is rejoicing over this for sure! But, my grandchildren are young – just eight, five and three – so I simplify the passage their Poppa and I are praying each week for them to join us in praying through Psalms this year. For my eight year old grandson, who is an excellent reader, I merely simplify the week’s prayer into four or five sentences. My five-year old grandson is just learning to read, so for him I use words I know he is able to read and make his prayer a bit simpler. 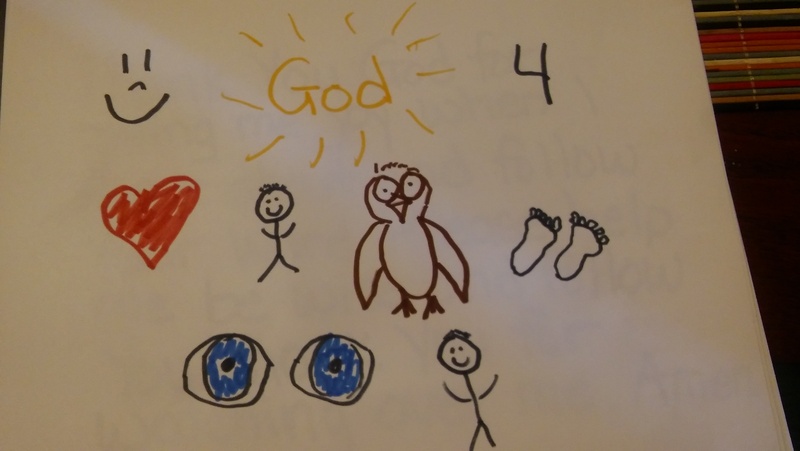 My three-year old grandson is not reading yet, so I draw pictures and talk with him about what they mean, to give him his own copy of our prayer – like his older brothers. All three boys put their prayers by their beds, so they are able to pray them before they go to sleep and/or when they get up in the morning. There are many things my husband and I teach our grandsons, but one of the most important is the truth about how God hears, listens to and answers their prayers. We teach and show them how they are able to talk with God by praying, with a focus on helping them learn to pray God’s Word. While God’s Word is not magic, it does have true power. God promises His Word will not return void, but it will accomplish what He has planned for it. Helping my grandsons learn to pray God’s Word into their lives is something which will last and may be used by God to encourage them and help them see His work in their lives. And this is something which truly matters to me! Isaiah 55:11 – So is my word that goes out from my mouth: It will not return to me empty, but will accomplish what I desire and achieve the purpose for which I sent it.